Daniel and I were invited to perform in the Hill and Hollow Music Series in Saranac, New York at the historic "Church in the Hollow." It was quite possibly the most humid/hot day of the summer. The full house sat fanning themselves in the pews while Daniel (dressed head to toe in black) played the gorgeous Steinway and I gave all I had to some high energy reels. Looking back on the photos/video, I can't help but smile to see how giggly we got in the heat. Regardless of the temperature, the audience called for an encore and we basked in the "warm" reception from the Hill and Hollow crowd. After the concert we enjoyed visiting with the fabulous audience and were touched when we read this wonderful review written by Angela Brown, our gracious host. Thanks also to Alicia Bodmer for her great camera work. 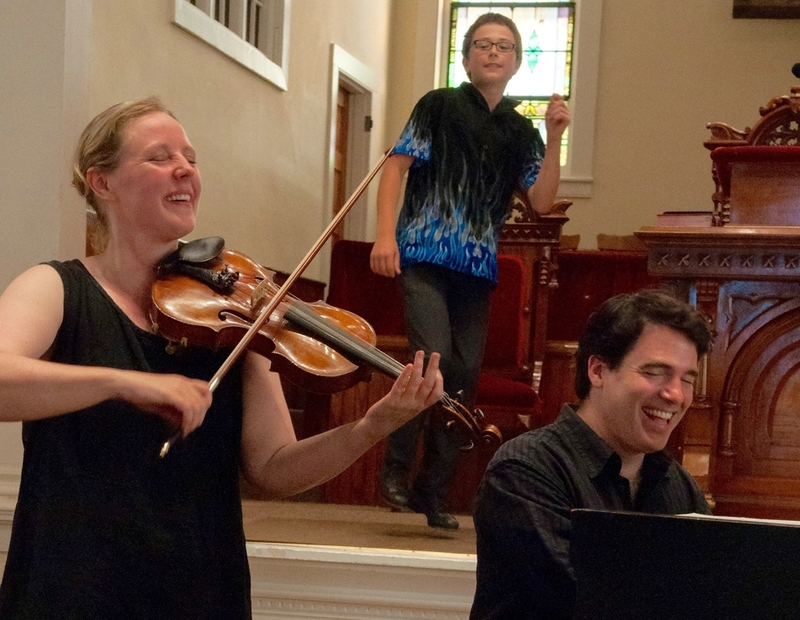 VIDEO--Fiddler Gretchen Koehler and jazz pianist Daniel Kelly perform at the Hill and Hollow Music Series.